Most of the adults snore and they do not realize the intensity until someone has told them. Only the persons sleeping beside a snorer will be able to tell the story. The rumbling and annoying sound is very irritating and can lead to insomnia for the persons around. The snoring sound can vary from simple wheezing to a rumbling train. Believe it or not, the problem needs to be checked right away so that the underlying reasons should be eradicated using these solutions. If you are a heavy snorer then you might be one of the 15% of the entire population of the USA. The heavy snorers have been thoroughly studied and checked for the specific reasons behind these inhuman snoring sounds. From mild to heavy, snoring needs to be diagnosed and checked for the cause. Apart from physiological causes, snoring is also harmful for a person’s mental condition. It can be quite embarrassing for them to cope with the society. Love life might get ruined. In fact, the frustration can also hamper the well being of a person. It has been found that snorers often face humiliation from those who have struggled to sleep at night. There is a big chance that the person will feel like a social pariah. He will feel like an alien and will definitely think twice before socializing with someone. He will be demoralized to spend time with his loved ones and will become very lonely, thus making his mental conditions worse. This is the reason why the doctors suggest the snorer to go for a full checkup. A thorough examination will definitely reveal the cause and a proper remedial step will be taken to make a snorer’s life better. A sleep study will reveal when a person snores. It depends on various factors which makes it hard to formulate a proper solution. From simpler BMI related issues to nasal deviation, anything can be the problem. This is why the medical practitioners always recommend doing a full examination under the supervision of the related professionals. Once the full examination report comes, it will become a lot easier for the doctors to recommend or prescribe a particular solution for the problem. Irrespective of all the above medical tests and treatments, here is the list of how a person can reduce the degree of snoring all by himself. As mentioned earlier, the cause behind the problem needs to be confirmed first before taking any remedial step. In some cases, even the smallest problems have gravest causes. On proper examination, the reason will be revealed and the doctors will be able to prescribe a unique way to get rid of the problem once and for all. The anti snoring solution will then be given to the snorer to relieve him from the health conditions. As per the medical world, if snoring goes untreated, it can lead to other grave problems. When snoring occurs, the air passages obstruct the airflow and cause the soft tissues to vibrate. It also means that the person will not be able to provide ample oxygen to his body when he is sleeping. The prolonged lack of oxygen will create various problems that are mentioned below. There are many other risks that a body becomes prone to when there is a lack of proper oxygen flow. Fortunately, there are ways to cure heavy snoring or obstructive sleep apnea. Using continuous positive airway pressure or CPAP will provide the best results to a snorer. After consulting a doctor and then a sleep specialist, the proper regime will be given to the snorer. This is one of the best known solutions for snoring that have been invented till date. 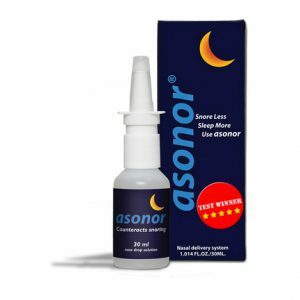 The anti snoring spray invented by Asonor is the ideal way to cure snoring once and for all. A simple dose of a few drops of this type of snoring sprays will give relief to the snorer. The snoring will reduce to a minimum and the person will find excellent results from the very next day. 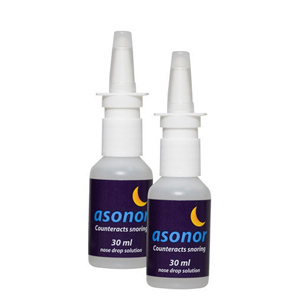 The reason behind the popularity of anti snoring spray is because of its compatibility with every patient. It does not cause any discomfort like all the mechanical enhancements such as mouthpiece, nasal strips, dilators, etc. A simple way of administering the dose also makes it easier to achieve a great result. The solution will keep your nasal passage fit for inhaling while sleeping without causing snoring. The unhindered flow of air can be guaranteed by the use of a nasal dilator or a strip. The strip is used outside the nasal bridge to keep the passage from collapsing. A proper adjustment of the lower jaw via using the mouthpiece might alleviate the snoring problem to a huge extent. Sleeping on your back will cause your lower jaw to relax and open. It will automatically push the tongue backward thus blocking the throat and the air passage. Eventually, a person will start snoring. It has been found that sleeping on your side alleviates snoring to a huge extent. The tongue remains in its position and does not block the throat anyhow. Allergies can cause your nasal blockage and make you snore. This is why the doctors first check whether you have allergies or not. If the reason behind snoring is unusual physiological features of the nasal region then a simple invasive procedure will cure the problem right away. In some cases, deviated nasal septum and or any kind of partial blockage can cause snoring. Using the right anti snoring solution will only be possible when the cause is known. Find it out and get rid of snoring once and for all.